Flavor 150 – Is it yours? By applecupcake on June 5th, 2010 . Filed under: Contests . Carolina Cupcakery wants to test your foodie skills in helping them create their record-breaking 150th cupcake flavor! Carolina Cupcakery currently has 144 flavors and counting. I couldn’t really contemplate 150 flavors of cupcake, until I visited their full menu. It was a mouth-watering experience. Each cupcake is sorted under a heading of chocolate, coconut, coffee, fruit/veggie, misc, nut, spice, vanilla/butter and special needs. I have a special need for a cupcake now! This isn’t the first time Carolina Cupcake has called on the public to be part of their cupcake design team. Jaina’s ‘Raspberry’ cupcake was the winner of cupcake flavor 100, – a chocolate cake stuffed with raspberry mousse, drizzled with dark chocolate ganache. 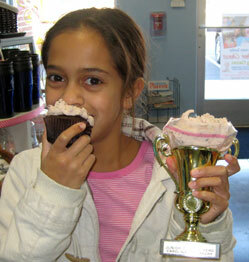 The photo below shows Jaina tucking into her creation and holding aloft her icing filled trophy. Contest entries should be emailed to flavors@carolinacupcakery.com and must be received before 9pm on June 9, 2010. The contest winner will be announced on June 10, 2010, at the store’s second anniversary celebration. Click here for more information. Hmm, I have a real craving now for the Apple Martini cupcake, it sounds divine! Rather fitting huh? 2 Responses to Flavor 150 – Is it yours? Hi all, managed to find your website by accident this morning, but I’m please that I have! Not only informative and also very easy to get through as opposed to a lot that I visit. (My site, is a review of hypnotherapy downloads). I was looking to see if I could work out what layout you had implemented, anyone have anny ideas? The site I’ve made is a review site for hypnotherapy downloads. I have the same profile on my site, which is related to hypnotherapy downloads, – yet for whatever reason it definitely seems to reload quicker on yours even though here you seem to have loads more entries. Have you used anything add-ons on your server that speed it up? — Sorry to go on, but lastly to say, I take pleasure in such a brilliant site and it’s obviously a great inspiration for my review site of hypnotherapy downloads. I’m planning to improve my own blog attempt. I definitely will visit this wonderful website often. Good – I should definitely pronounce, impressed with your website. I had no trouble navigating through all tabs as well as related information ended up being truly simple to do to access. I recently found what I hoped for before you know it in the least. Reasonably unusual. Is likely to appreciate it for those who add forums or something, web site theme . a tones way for your customer to communicate. Nice task.